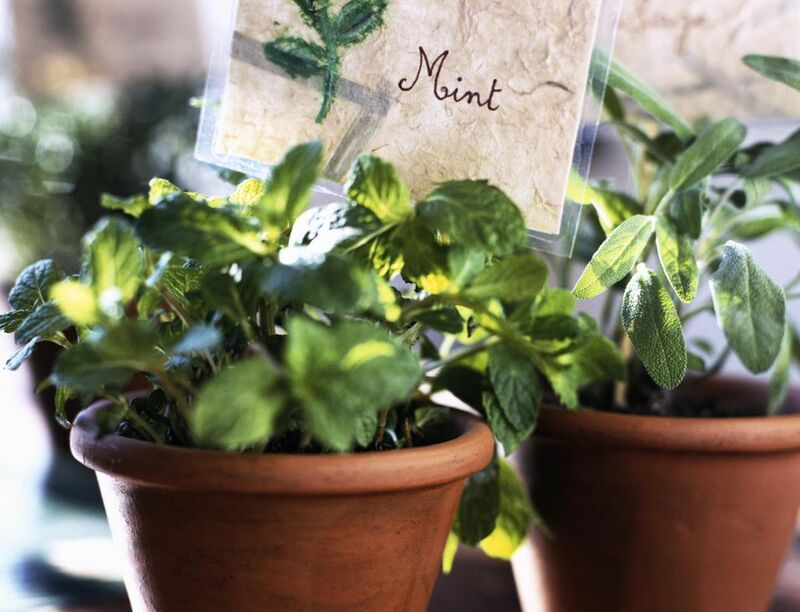 Varieties of mint (Mentha) are some of the easiest and most popular herbs to grow. Plants in the mint family are very hardy perennials with vigorous growth habits. Mint, left to its own devices, will spread quickly and become a nuisance. However, it is very useful as a flavorful culinary herb and the plants can certainly be grown without much care. Just try to choose a spot where you will not mind the rampant growth or grow it in a confined space like a container or between paved areas. Mint really wants to be a ground cover. The long branches grow upward and then flop over and root, spreading the plant wherever it can reach. The spikes of white or pinkish flowers are attractive, brief, and do attract bees, butterflies, and even birds. Mints are easy to identify and not just because of their spicy scent. All members of the mint family have square stems. There is not really much that mint needs besides moisture and rich soil. It is pretty hard to kill a mint plant. The only maintenance required will be to make sure that you keep the mint in check and watch for overgrowth. It will take over your garden if you let it. Harvest or shear the plants to keep them lush with leaves. Mint plants prefer partial shade. You can grow it in full sun if you water it frequently. Mint is one of the few culinary herbs that grow ​well in shady areas. Mint prefers a rich soil with a slightly acidic pH between 6.5 and 7.0. If the soil is somewhat lean, top dress yearly with organic matter and apply an organic fertilizer mid-season after shearing. One thing mint needs is constantly moist soil with adequate drainage. Mint plants like water, but they cannot withstand soggy soil and wet feet. Upon touch, if the soil feels dry, add water. It is probably best to water the plants in the morning so that they have plenty of moisture by the time the hotter afternoon sun hits. Hardiness will depend on the variety you are growing, but mints are widely adaptable. Peppermint (Mentha piperita) is very cold hardy able to withstand the cooler temperatures in USDA hardiness zone 3. Spearmint (Mentha spicata) handles the heat best and can grow in zone 11. If you are growing your mint indoors, you will need to provide humidity. You can achieve this by misting the plant between waterings or set the container on a water-filled tray of pebbles. Feed container mint a balanced, all-purpose liquid fertilizer in early spring when new growth emerges. Fertilize every four to six weeks after that and throughout the growing season. Nutrients seem to leach away quicker from potted plants that are frequently watered. As an edible herb, it is non-toxic to humans. However, according to the ASPCA, the essential oils in mint are toxic to dogs, cats, and horses. If a lot is ingested, it can cause vomiting and diarrhea. To contain the roots and limit spreading, you can grow mint in containers, above or sunk into the ground. Be careful to keep container mints from flopping over and touching the ground. It might be best to keep them on patios or paved areas because they will root and spread wherever they touch the ground. Even in pots, there will be more than enough to harvest and you will not have to worry about the high maintenance of keeping the plants in check. You can start harvesting mint leaves once the plants have multiple stems that are about 6 to 8 inches long. This should take about two months from seed, or less time if you are buying plants. Do not harvest more than one-third of the plant at any time, to prevent weakening the plants and sending them into decline. Snip sprigs and leaves as needed. If you do not harvest your mint regularly, it will benefit greatly from a shearing mid-season. At some point, you will probably notice the stems getting longer and the leaves getting shorter. That is the time to cut the plants back by one-third to one-half. This will encourage them to send out fresh new foliage again, with good sized leaves. You can do small patches at a time, if you have a lot of mint, and prolong the harvest season. Remember, all cuttings can be used, dried, or frozen for later use. Many mints work well in herbal lawns. They will need to be kept mowed if you plan on walking on them, but this will help control their spread and the scent will make the work more pleasant. Mint can sometimes get rust, which appears as small orange spots on the undersides of leaves. Use an organic fungicide and try to allow plants to dry between waterings.​ Stressed plants may also be bothered by whitefly, spider mites, aphids, and mealybugs. Cuttings of mint will root easily in soil or water and mature plants can be divided and transplanted. And, you can always start new plants from seed. Although, most mint plants are hybrids and will not grow true from seed. Sow outdoors in late spring or start seed indoors about eight to 10 weeks before the last frost. Keep soil moist until the seed germinates. Mint seed germinates in 10 to 15 days. Seed-grown plants should reach harvestable size within two months. Mentha piperita (Peppermint): This is the best for mint flavoring. It grows in USDA zones 3 through 11. Mentha piperita citrata (Orange mint): This is one of the tangiest of the fruit-flavored mints. It grows in USDA zones 4 through 11. Mentha suaveoloens (Apple mint): It combines the flavors of apple and mint. It grows in USDA zones 5 through 11. Mentha suaveolens variegata (Pineapple mint): This is a variegated offshoot of apple mint. It grows in USDA zones 6 through 11.